Summer is finally upon us and I know many of you are ready to get out and have some summer adventures of your own! Well, you’re in luck, because we have mapped out an Epic Southern Utah Road Trip that is sure to give you some adventures! We have even added in an approximate budget based on what we spent for this road trip. We are budget travelers and we know that many of our fans like to keep the costs down as well. This trip is based on car/tent camping or being in an RV. We have a list of necessary equipment to make the trip as epic as possible! So, we hope you enjoy this southern Utah road trip! Disclaimer: this trip is not a leisurely, relaxing week at the beach; that’s not our style! You’ll be starting the Epic Southern Utah Road Trip heading to Moab, Utah. Depending on where you are coming from, you can easily reverse this trip and start in Zion National Park and work towards Moab. Day 1: Arrive in Moab and find your campsite. Willow Springs Road is a great free camping area, and it has more than plenty of campsites. If this area is full, there are also free camping areas off of Road 313 in the Lone Mesa Campground. For even more campsites, visit freecampsites.net. Go into town and explore a little! The Moab Brewery is the ONLY microbrewery around, and also the only place you can get a beer that is over 3.2% ABV. Utah liquor laws are very strict (and very weird), so if you are planning to have a beer on this trip, stock up your cooler while you are in Moab at the State Liquor Store. There are virtually no others on this trip until you get to Zion. Better yet, stock up BEFORE you get into Utah, as the prices are jacked up and the beer is not full strength. If you are coming from Colorado, this is a no-brainer; stock up on the awesome microbrews there! You have been warned! Moab is a great starting point for the Epic Southern Utah Road Trip because of the places to get gear and food. Day 2: Getting an early start on your first real day of the Epic Southern Utah Road Trip, head over to Corona Arch for some hiking. This trail takes about 2.5 hours to complete at a leisurely pace with stops for plenty of pictures at the arch. It’s hot, so getting an early start (especially in the summer) is a must! There is no water on this trail, so be sure to pack plenty of it. After your hike to Corona Arch, grab a quick lunch and get ready for your next adventure! Depending on your skillset/and activity preferences, you have a few options here. Mountain biking the Monitor-Merrimac Trail, climbing Wall Street, or even kayaking down the Fisher Towers section of the Colorado River. All of these activities are perfect afternoon adventures and are sure to get your blood pumping! Day 3: It’ll be tough leaving Moab after those first two amazing days of your Epic Southern Utah Road Trip, but it’s time to head out to your next adventure! Head out of Moab early on Highway 191 just past Blanding, then take Highway 95 over to Natural Bridges National Monument. Remember to have your America the Beautiful pass to get into this monument! Take a couple hours to explore the natural bridges here. They are pretty incredible, and can all be seen from the road. The last one you come to is only about a quarter mile hike down to it, and is totally worth it. This makes for a nice side trip and halfway point to get out and stretch your legs! After Natural Bridges National Monument, continue on your journey towards Capitol Reef National Park on Highway 24. When you arrive, set up camp anywhere along Highway 24. Here was the super secret spot we camped, but there are tons of pull off areas to camp, and it is all BLM land all the way up to the entrance of the park. If you have a hard time finding a spot to camp on Hwy 24 before you reach the entry sign to the park, go south on Notom road as there is more camping down there (and that’s where the slot canyons are as well). Day 4: Add a hike in Capitol Reef National Park to your Epic Southern Utah Road Trip. Depending on what time of year you go, there will be different things to explore. There are several slot canyons here, as well as some easy, scenic hikes like Grand Wash. Head up to Panorama Point for a gorgeous vantage point of the park. After your day hike, you’ll be heading out again (so pack up your camp before you leave for your hike). Continuing on your journey, you’ll go all the way through Capitol Reef National Park on Highway 24 before turning south on Highway 12 toward Escalante. This drive is BEAUTIFUL! Don’t sell yourself short by driving it at night. You will be driving through the Dixie National Forest, Anasazi State Park, and the Grand Staircase-Escalante National Monument. Part of this drive is on a ridgeline, so you will have 360 degrees of awe-inspiring views. Trust me, you’ll need to stop for a few pictures! Once you arrive in Escalante, set up your camp off of Hole in the Rock Road. There are plenty of spaces out here and it’s accessible pretty quickly and easily from the highway. There is a visitor’s center on the other side of Escalante that you can grab some maps from as well as fill up your fresh water jug. There are some awesome slot canyons in Escalante along the Epic Southern Utah Road Trip. Day 5: This leg of the Epic Southern Utah Road Trip will be hiking (canyoneering) in Escalante! There are a lot of trails in the Grand Staircase-Escalante National Monument, but of course the one we are going to recommend is Spooky and Peekaboo Slot Canyons! If you haven’t checked out our post on these, do so now! We HIGHLY recommend this hike, and it is great for families as well. The two slot canyons are narrow, so be sure to keep an eye on the weather before you head into them. We wish there was more time in Escalante, but alas, the epic southern Utah road trip must continue! Head out this afternoon/evening and head to Bryce Canyon National Park. Skip the gimmicks in Bryce Canyon City and get even closer to the park off of Highway 63 on Fire Road 090. This is National Forest land and free camping is all along this road and Fire Road 089. Take your pick, get set up, and get a good night’s rest! *BONUS* If you arrive before sunset, head over to Sunset Point about an hour before the sun sets. The sun sets on the other side of the canyon, so the actual setting of the sun is behind the trees. However, just before sunset, the shadows that are thrown throughout the hoodoos below make for some great views. Don’t expect a spectacular sunset, but the hour before is pretty neat! Day 6: Today on the Epic Southern Utah Road Trip, you will get an early start to the day before setting out on an 8.1-mile trek through the Fairyland Loop. On this trek, you will see a lot of the park’s most famous attributes, such as hoodoos, the Tower Bridge, and the Rim Trail. Be sure you pack plenty of food and water for this hike, as it should take you around 4-5 hours to complete. This trail is not as packed as many of the other trails in Bryce Canyon National Park, but you won’t have the trail to yourself (sadly). *BONUS* Get up super early before the sun rises and start this trail early. You will come to Sunrise Point about 2 miles into your hike, so getting an early start will give you awesome views to watch the sunrise! Otherwise, you can do the sunset viewing the night before (we are not early risers, so we did NOT get up that early). After your hike, you’ll be ready for a nap… but NO! This is the Epic Southern Utah Road Trip; we don’t have time for sleep! Grab your gear and head to Zion National Park! If you are traveling via motorhome, you will have to take the long way around to Zion, down Highway 89 all the way into Arizona, then 389/59 back up towards Hurricane in order to avoid some sketchy passes. However, if you are in a car, sketchy pass away! You will want to end up on the La Verkin side of Zion, and free camping here is on the La Verkin Overlook. There are several spots here, although not many of them are shown on freecampsites.net. It’s all BLM land, so just be sure you pick a spot where there is already a fire ring. When the Epic Southern Utah Road Trip takes you to Zion, here is where to gear up! Day 7: Your last day of the Epic Southern Utah Road Trip will be spent adventuring in Zion National Park. 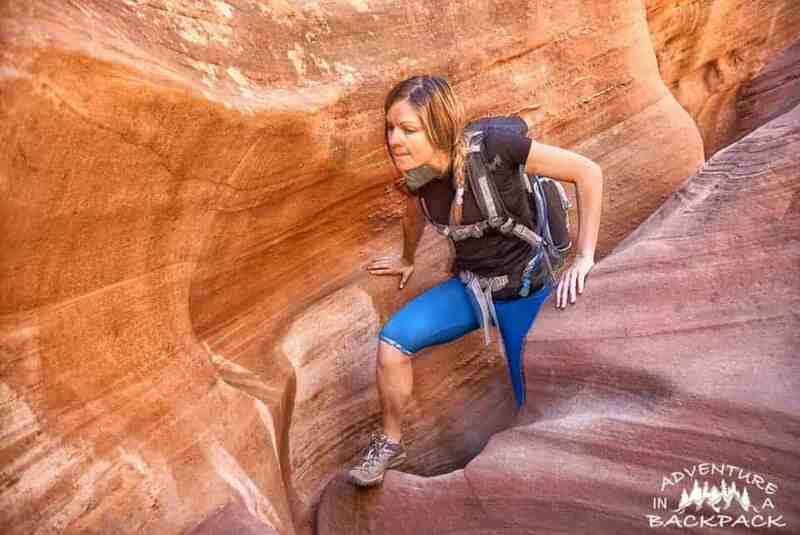 Pick your adventure from the many hikes available in Zion to the slot canyons. Most of the slots are technical, so be prepared! We hiked Angel’s Landing and didn’t love it, but check out our post to see why! Unfortunately, many of the slots were still impassable due to weather when we were there, so be sure to stop at the visitor’s center for more info on great hikes for all skill levels! This concludes your Epic Southern Utah Road Trip! How do you feel? We hope you are worn smooth out and need a few days to recuperate from the awesomeness you just experienced! Activities: $0 – other than the America the Beautiful pass, all activities listed above are free of charge, granted you bring your own equipment. Hiking is always the cheapest option, since the gear needed is YOU (and some water)! In order to make all of this happen on this budget, you will need a bit of equipment. Luckily, once you have purchased this gear, you can use it over and over for all of your adventures! Links to recommended items are included in the post above.